IT ’S THE BOTTOM OF THE NINTH . . . Baseball is her least-favorite sport. Falling behind golf, tennis, and maybe even curling. What Izzy knows about baseball could fill about three minutes of airtime. Her last experience in front of a camera was in college. Six years ago. The Pioneers’ second baseman has a wicked sense of humor and even wickeder blue eyes. AND A FULL COUNT. . .
Jack Bennett couldn’t be more uninterested in a little sideline action. He just wants to show up at the park and win baseball games. Izzy is the one woman he should steer clear of, but she’s also the key to his success–and his heart, too. All Izzy has to do is convince her misogynistic boss she’s competent, learn what the heck an RBI is, and stay away from Jack Bennett. Izzy tells herself it’ll be a snap, but 162 games is longer than she ever imagined and Jack more irresistible than she counted on. I love baseball and I love romance. I was really excited to get to read and review a book that combined the two. Many sports romance books have a predictable plot and boring characters. THE LUCKY CHARM was a delightfully, refreshing story. Izzy is a sweet girl who is thrown into a job that she doesn’t care to do. I love that the author did not transform her into a plastic beauty in order for her to do her job. Izzy meets Jack Bennett and he’s not the good looking golden boy ball player. Jack’s the normal guy who lives and loves baseball. It was very refreshing that the two main characters didn’t fall in love at first sight and then fall in bed within moments of meeting each other. 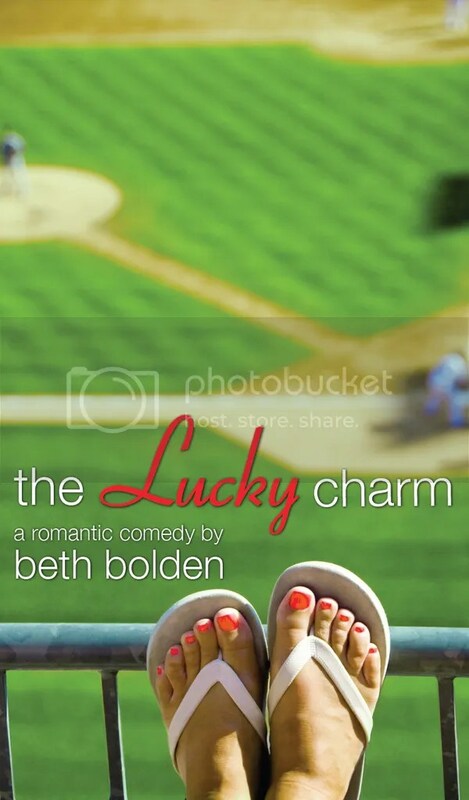 THE LUCKY CHARM is a fun read with believable characters and a romance that felt very natural. Beth Bolden lives in Portland, Oregon with one cat and one fiance. She wholly believes in Keeping Portland Weird, but wishes she didn’t have to make the yearly pilgrimage up to Seattle to watch her Boston Red Sox play baseball. If only the Portland Pioneers weren’t only figments of her imagination. After graduating from university with a degree in English, Beth unsurprisingly had no idea what to do with her life, and spent the next few years working for a medical equipment supplier, a technology company, and an accounting firm. Now Beth runs her own business as a Girl Friday for small business owners, assisting them with administration, bookkeeping and their general sanity. Beth has been writing practically since she learned the alphabet. Unfortunately, her first foray into novel writing, titled Big Bear with Sparkly Earrings, wasn’t a bestseller, but hope springs eternal. Her first novel, The Lucky Charm, will be available in the beginning of 2014. In her nonexistent spare time, she enjoys preparing overambitious recipes, baking yummy treats, cuddling with the aforementioned cat and fiance, and of course, writing. She’s currently at work on the The Lucky Charm‘s sequel, featuring Noah Fox. She hopes he’s a lot easier to wrangle than Jack Bennett was.